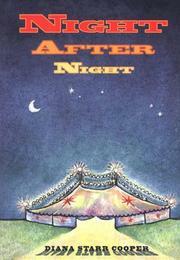  Poet Cooper's rapt meditations on circus life and a night's performance by the Big Apple Circus. Cooper shifts subjects as rapidly as a circus changes acts, starting with an overview: ``Seen from a field at night, with its swags of white lights scalloped from mast to mast against the sky, it looks like an ocean liner far out on the water. Yet it is still a tent.'' The Big Apple Circus appears annually in Manhattan, in Lincoln Center's Damrosch Park, with its trucks, trailers, and horse and elephant stalls. A one-ring circus, it brings focus, rather than diffusing attention among multiple rings. ``Elephants smell, deliciously, of elephants. Beautiful ladies sweat.'' Aerialists deliberately chalk their hands, smile at their risks, and make flying real. In lyrical prose, Cooper makes palpable the electricity flowing between audience and performers, whose displays of technical excellence are ``virtuoso moments''--don't call them ``tricks.'' Cooper is especially rich on the complicated wonders of elephants and goes on for many splendid pages about the nuances of their characters and their physical presence. But then she is absolutely serious about all the circus animals, their individual natures, their minds. A small book immensely alive and flowing with feeling.